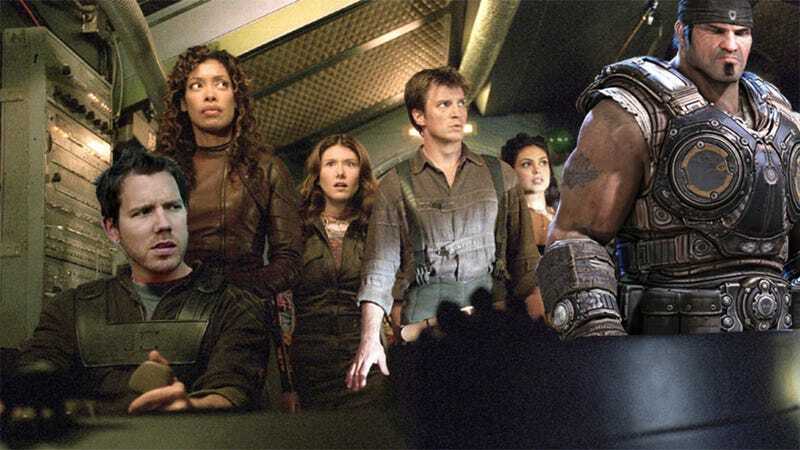 Gears of War designer Cliff Bleszinski, who says he'd love to turn Firefly into a video game, has some interesting ideas for a hypothetical game based on the beloved sci-fi franchise. He even chatted with Firefly creator Joss Whedon this year about the pipe dream, as unlikely as it may be. Yesterday I sent a note to Bleszinski's crew over at Epic Games to ask him a simple question: How would you make a Firefly game? Here's what he told me. First off, a little expectation management in regards to this. The chances of Epic Games working on an external property are darned near zero. So, remember, this is all hypothetical, pie-in-the-sky "What if Uncle Ben was Never Killed" Spider-Man kind of stuff. I've been a Joss Whedon fanboy for years. Buffy is one of my favorite shows ever created. In fact, if you were to open up Unreal 1, you'd find that some of my trigger tags in there were various allusions to how hot I thought Sarah Michelle Gellar was. I enjoyed Angel, and fell in love with all things Firefly. Fun fact: I was able to visit the set of Serenity when they were filming the death of Wash. I was standing there while Joss was holding the camera and the set was shaking. They nearly built out that entire ship on that lot, which I admire, because CG backgrounds can take away from the overall vibe. The next time you watch the scene, consider that I was there, off to the side, shitting my pants off and hoping I didn't ruin the shot. I've been fortunate enough to run into Joss on several occasions. Years ago at E3, I was able to take Joss and Nate Fillion to an Unreal Engine 3 tech demo, and upon leaving the convention center Joss said, "I've seen more creativity in there in 15 minutes than I've seen in years in Hollywood." For me personally, the only external properties I would ever consider adapting to game form are Joss properties. Cut to 2012 where Joss and I often wind up running into each other at parties and, in the midst of a dance-a-palooza, I was able to congratulate him on the success of The Avengers (that kind of commercial success is long overdue for a man of his talent) and also tell him that someday it would be sweet to do a Firefly game. Think about it. The universe is ready to go. On one side you have the Alliance, on the other you have former Browncoats running smuggling operations, and both are terrified of the Reavers. With space combat, you could do first-person gunfights "sci-fi Wild West" style on the ground with crazy escapes back to your shuttle, and everything in between. When I watched Firefly, I got a similar feeling to when Ron Gilbert went on Pirates of the Caribbean - I wanted to just exist in this world, I wanted to be myself on that ship with that crew. The crew of Firefly feels like a family; the final shots of some episodes showing them eating dinner together at a very retro table are there for a reason. One thing Joss has always been amazing at is portraying the motley crew that comes together as a family to overcome challenges. Going back to game possibilities, the ship may be somewhat similar to the Normandy in Mass Effect, as well as some of the dialogue trees. Consider Kinect voice interactions with the crew to further push immersion, along with awesome Wing Commander-style dogfights and you can just SHUT UP AND TAKE MY MONEY. That's just a "what if."